Okay, that’s a HUGE question. And I’m going to answer it completely differently today than I would have yesterday, because I FINALLY got to go to a Saudi wedding last night. This is a big deal to me. I’ve been coveting an invitation the whole time I’ve been here, and the fact that it’s taken this long is a partial answer to the question. Saudi Arabia, however, is different. It is a country and culture behind walls. At the outermost layer, foreigners aren’t allowed into the country at all unless they’re attached to a sponsoring employer or participating in the pilgrimage to Mecca. At the end of employment (or business consultation or conference), you’re out. And don’t come back. As for Hajj pilgrims, thanks for coming, but no touring around. Get out. If you manage to breach the border, you don’t find a visibly warm welcome inside. Private property is hidden behind high walls and metal doors. Exterior windows are small and often barred. Restaurants have curtained booths. Public spaces are divided, so that women can be secluded from men. Women’s bodies are hidden under black drapes. In addition to the headscarf, most women cover their faces below the eyes so you can’t even interact with a full human face. The combined effect, I hope Saudis will understand, is off-putting to outsiders. From border control to cityscape to private space to body language to clothing…in every possible unspoken way, the message is consistent: Look away. What’s going on here is none of your business. Which is what makes the spoken message, coming from inside all that, so startling: Welcome, my brother, my sister. Come into my home. Please, let me make you tea. Join us. Thank you for coming. You are an honored guest. The trick is finding a way to step across the divide. The more Saudis are in your everyday encounters, the more easily it happens. But many expats just don’t cross daily paths with a lot of Saudis. In my husband’s office, for example, are four. The remaining twenty-five are fellow expats from other countries. If we were in any other country, we’d be living in a neighborhood that would insert us in the community, give us neighbors and regular shops and cafes. But in Saudi Arabia, where I can’t drive and have to cover to go outside, we live in a compound to give us some freedom of movement at home and support in doing necessary things that are uniquely hard here (going shopping, getting things repaired, arranging for transportation, getting exercise). My daily contact with Saudis? Zero. Now let’s add the restriction forbidding association between unrelated men and women, and my opportunities to have contact with Saudis are limited to brush-bys with other women in public. I’m sorry, but I have never, in my life, in any country, had a woman walk up to me at the supermarket and say, “Hi. You look nonthreatening and are probably a good conversationalist. Would you like to go get a sandwich?” Oh—and then there’s the language. She’d have to speak English, which pretty close to zero women my age do in Saudi Arabia. So now I’m limited to women my daughters’ ages with foreign educations making that same proposal. Not happenin’. So I hang out with a lot of fellow foreigners. Sigh. UNTIL LAST NIGHT. I finally got a toe in the door, folks. The brother of one of my husband’s (four) Saudi co-workers was getting married, and he invited us to the wedding. It’s quite different from a typical Western wedding, whether religious or secular. First, of course, women and men attend separate events, often in completely different venues miles apart. In this case, conveniently, both were at the same facility. My husband dropped me at the door with the swirl of black robes outside. Go in the door, step around the abaya-check wall, and whoof–through the dimension-changing wormhole into a sea of ballgowns and cocktail dresses, of satin and lace, of rhinestones and pearls and sequins and feathers. Our host’s wife was there to greet me. We’d never met, but the blond six-footer wasn’t hard to spot. She took my hand and pressed her cheek to mine, then introduced me to a couple of young teenage nieces behind her, who did the same. (I’d been expecting the European two-cheek kiss I exchange with most women here, but no—the Saudi greeting is an unspecified number of cheek-touches on the same side. The girls giggled as I fumbled it.) Inside the hall, women everywhere, all doing the same. Clasping hands, pressing cheeks, smiling, laughing, embracing, talking, laughing, taking joy in each other. As I’ve watched the news this week of another American city torn over racial tensions, what I see is fear, on all sides, and I’m struck by the repeated calls in every religion to fear not. How would our individual lives, our communities, our world be changed if we could school ourselves to not be afraid of the new, the different, the other? If we could ask ourselves, before we speak or act or go along with somebody else’s divisive speech, “Does this encourage understanding, or fear?” These women believed in the goodness of a stranger among them, trusted me, wanted to show me their love. I owe it to them to pass it on. Because as hard as it can be to get past the barriers that divide us from each other, I can picture a promised land on the other side that looks a lot like that roomful of women. *The wedding itself was too fabulous and too rich to squeeze into this post. The separate writeup is here. Wonderful! I’m still waiting for my wedding invitation. Although, a student did invite me once to his endurance horse race. Margo, what is in the picture? At least on my iPad, it is darkened. I really enjoyed this entry and look forward to hearing more about the wedding. So once inside, all the women took off their abayas and were able to show off their gowns? Curious about your attire… Souk find or special purchase? 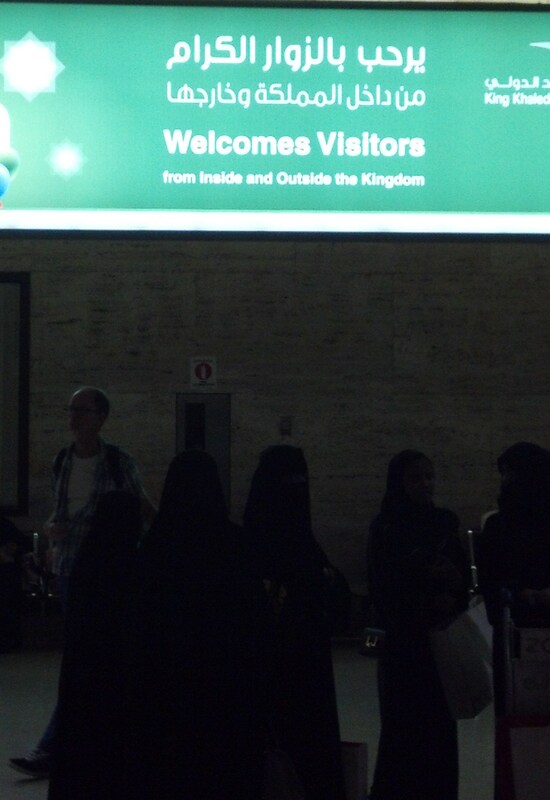 The picture is of a sign in the baggage claim area of the airport, saying the Kingdom welcomes visitors from both inside and outside the Kingdom. It’s a lit sign, so the area below it does appear quite dark, but the sign itself is what I meant to show. As for my dress…more to follow, but when in Saudi, make sure you have something! That’s a VERY good way to put it. Thank you! Margot, thank you for this posting, its generous of you to share this with us. I have lived here in Singapore with my ‘adopted’ (by marriage) Singapore Indian Muslim family. Basics are easier, most speak English, yet not all and not always comfortably, some of them may prefer Tamil. I converted by choice to Islam several years after my wife and I married. I’m an Aussie by the way. I’ve lived here in Singapore for 14 years. Yet at a baby naming ceremony two nights ago here in SG it become increasingly tough to mix, as more and more relatives of Indian Muslim background joined the function including visitors from Dubai (Indian Muslim merchants there originally from India). In this case language was a barrier, and sometimes fear of ‘doing wrong’. Soon (inshallah, December) my wife and I will be moving to Riyadh. Like you I crave the connection, the experience of meeting the locals whenever I travel. I hope that despite our choosing to live in a compound, we can connect locally with families and share. It’s quite clear from your experience, they also crave sharing and love hosting us too. The same warmth I receive many times despite language and cultural challenges, they are much surpassed by common human love and sharing of things we are proud of, home, family and food too. Good times. Perhaps my wife, can connect with you when we move there…she will need connections as I go to work too. Again thank you for sharing your experiences. Thank you for writing! I imagine you’ll have an easier time connecting than I have, both through being Muslim and through your profession, which will put you in daily contact with local people. And compound life will give you different connections, as well, which are each enriching as well. Best wishes for your move, and inshallah, I would love to hear from you when you arrive! Thank you Margot, I will plan for connection with you later on then. Best to your family in your move!